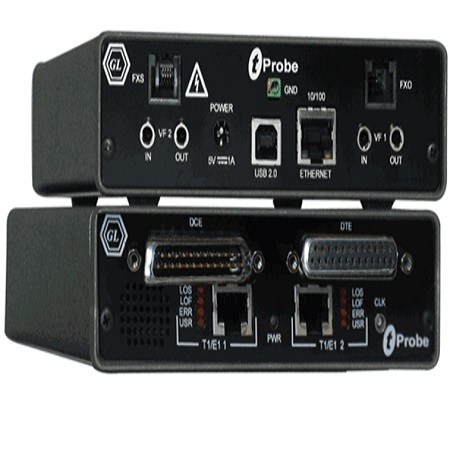 GL's new tProbe™ is an enhanced version of our popular USB based T1 E1 VF Analyzer / Emulator. This hardware incorporates all the features of the previous analyzer such as portability, USB interface, remote accessibility, scripting, and a vast collection of optional applications. GL's tProbe™ also includes ability to add optional boards such as theDatacom Analyzer, and FXO-FXS Simulation boards. The FXO port on tProbe™ allows to simulate a two-wire FXO device such as a telephone or a fax machine. This feature allows you to capture and analyze data from a two-wire telephone line, as well as to generate and transmit analog data onto that two-wire line. Similarly, the FXS port on tProbe™ emulates a two-wire FXS service such as a telephone wall jack. This feature allows you to interface with an FXO device such as a telephone. Server commands allow you to provide standard FXS features such as monitoring for the off-hook line, sending ring signals, and providing dial tone.